Well, our big girl turned 4 last weekend! Hard to believe we've been parents for 4 years already. Seems like we should be good at by now... She's so tall and lanky looking now compared to her old chubby baby self. But she's so clever and fun now! Our favorite thing lately is to label trees as either deciduous or evergreen and she picks some leaves to bring home and press to keep. It's amazing what having an actual autumn can teach kids! Her other favorite thing to learn about is how her body works. We recently got a simple book about the brain from her grandma, and she reads it almost every day and is learning words like "cerebrum" and "brain stem" and "spinal cord." It's so fun to see her soaking up all the information and understanding how things work! 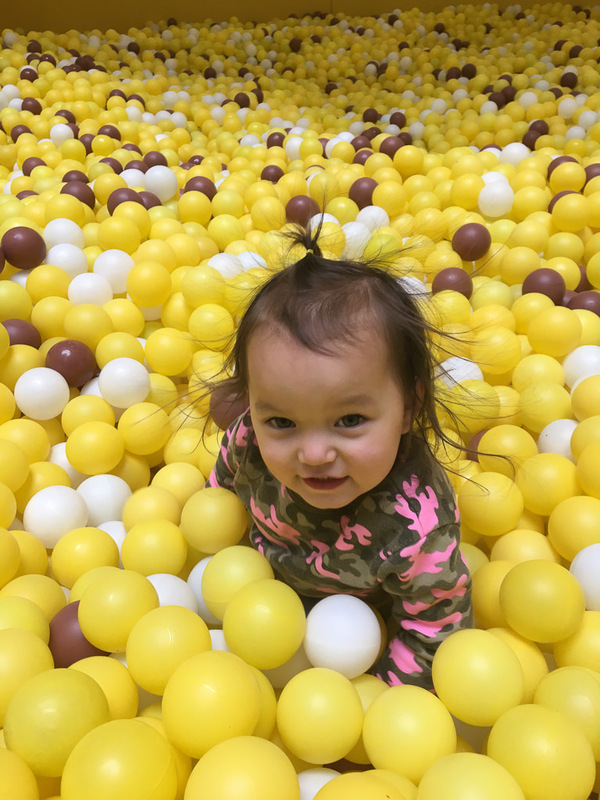 Anyway, for her birthday, she wanted to go play with some friends at this ball pit that they have in a lot of malls here. It's like nothing I've ever seen before. 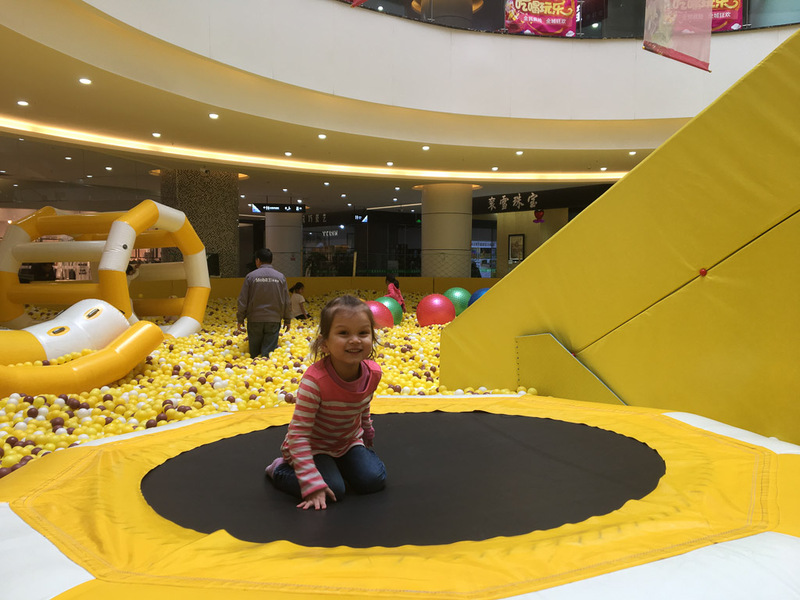 It's a giant pit of balls, just like used to be at McDonald's but like 30x bigger and with a GIANT slide and all kinds of inflatable toys to jump around on. It would be a litigation nightmare in the States. But hey, it was a blast! So the kids and some friends played there for several hours of non-stop running, jumping and sliding and then we went to the restaurant of M's choice (the one where the hostesses wear fancy traditional dresses and it's expensive - the first point being the main thing for M). And we had a delicious lunch followed by a rainbow cake ("Because I have a rainbow on my wall in my room, so I wanted a rainbow cake.") which was maybe the best cake I've had since we got here. The next day, which was her actual birthday, we made flourless chocolate cupcakes together, which is basically a super rich brownie and opened presents, which she obviously loved. We bought her a Lammily doll which she hardly ever parts with now. "It's special because it looks like a real person," she tells E.
Look! Her head goes backwards! So wonderful to see her so happy! I was really worried that she would be disappointed because we wouldn't be able to do a big party like we have in the past, but the weekend was perfect! 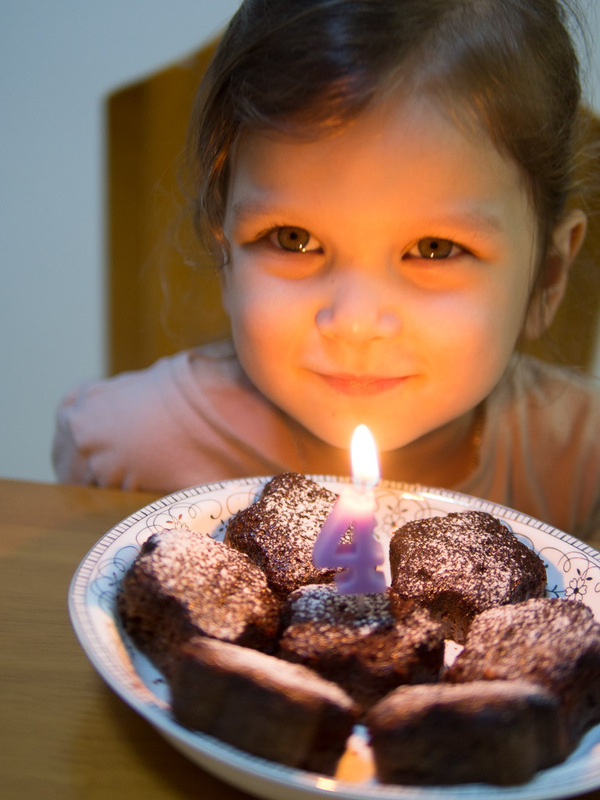 We're so grateful to have had four years with such a wonderful little girl. By the way, it's snowing right now as I write this. Well, I was originally planning to write about something else, but a trip to the butcher made me so excited about lamb that I can't resist writing about that! Lamb here is delicous.